After Mario Kart 64, Mario Kart: Super Circuit5 came out as the first Mario Kart for a handheld system. Then Mario Kart: Double Dash! !6, with karts that could carry two riders, was released for the GameCube. Konno-san, you didn’t work on these two games. Why was that? 5 Mario Kart: Super Circuit: The third game in the series. Released in Europe in September of 2001 for the Game Boy Advance. 6 Mario Kart: Double Dash!! : The fourth game in the series. Released in Europe in November of 2003 for the Nintendo GameCube. There isn’t any one particular reason. Around that time I was doing a lot of work with second party developers, and was involved with the development of Luigi’s Mansion7. 7 Luigi’s Mansion: An action-adventure game simultaneously released with the GameCube in Europe in May of 2002. Later on, we decided to make Mario Kart DS8. After about nine years away from Mario Kart, you returned to work on another game for the series. 8 Mario Kart DS: The fifth game in the series. Released in Europe in November of 2005 for the Nintendo DS. Our group started development of Nintendogs9 and Mario Kart DS at almost exactly the same time. I was producer for both of these, but Miyamoto-san said that he wanted me to oversee the work more as a director, and that, otherwise, the rest is up to me! (laughs) 9 Nintendogs: A game that invites you to enjoy communication with puppies. Released in Europe in October of 2005 for the Nintendo DS. Wasn’t it difficult switching mindset when working on two games so different from each other? Each title had its own director, and I would say to myself, “Okay, today is a Mario Kart DS day and tomorrow is a Nintendogs day.” But sometimes the director of Mario Kart DS would want to meet on a Nintendogs day. I’d have him wait until evening, and then, after I’d driven all the dogs out of my head, we’d sit down and talk. As a director I’m used to working on single projects at a time, but it was the first time I had been involved with multiple projects at once, so it was quite a challenge. I understood what it must be like for Miyamoto-san. So you understood, for the first time, how hard it is to be Miyamoto-san. That’s probably why he had you work on two projects at once. (to Miyamoto-san) Is that so? By the way, Mario Kart DS was the first title to support Wi-Fi Connection10, right? 10 Wi-Fi Connection: More formally, Nintendo Wi-Fi Connection. A wireless Internet service first used with the Nintendo DS. That’s right. We wanted to use Wi-Fi technology to jump from the four-person gameplay of Mario Kart 64 so that eight people can play simultaneously. 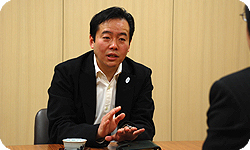 Konno-san is one of our foremost online gamers within the company. I had you join meetings we held among representatives from the various departments to discuss the development of Nintendo Wi-Fi Connection. But at the time, I’d been hearing about it pretty clearly for a while. Wasn’t your knowledge as an online gamer useful in starting up Wi-Fi Connection? I suppose it was. 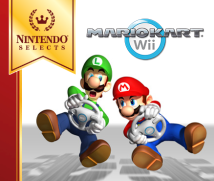 When we began development of Mario Kart DS, though, there weren’t any plans for it to be compatible with Wi-Fi. I thought it would be great to adapt it to Wi-Fi, but like when you’re throwing shells, it’s a game with a lot of simultaneous activity among the players, so I thought it would not be easy to make it happen. If it was going to be a conventional video game where the only thing a player could do was drive, I think that it could have been done in a variety of ways. So we originally put a lot of our efforts into developing a fun game that could be played with up to eight people that are close by using a wireless connection. When it began to look like it would work, we thought it would be even more fun if people living further away could be included in the gameplay, and in 2005 we began experimenting with Wi-Fi. 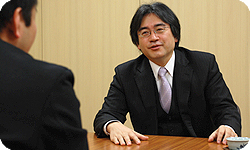 Around April I went with Iwata-san to NOA (Nintendo of America) to discuss Wi-Fi Connection and made the presentation. The response was so great, that we soon began working on it in earnest. I remember that well, too. It’s my impression that, even with half a year left until release, it was coming along nicely. You were able to show that, even if there were, to use a technical term, latency—in other words a communication delay—we were able to process it in a way where it was much less noticeable, and we felt playing it could be plenty of fun. We finished in time for the year-end release, but personally I’d wanted to do more. For example, like the ranking system and making it so that lots of people could share Ghost Data. Things like that. It seems that you knew from the start exactly what it would take to make an online game fun, but the company was saying it needed to be released by the end of 2005, it was our first software that used Wi-Fi, which meant you weren’t able to take a lot of risks at once, so it must have been difficult for you to find the right balance. That’s absolutely right. But I also knew that trying to do too many things at once wouldn’t get us anywhere. Konno-san, I remember how frustrated you looked. At a meeting, you had this completely unsatisfied look on your face and talked about how you had given up on a certain idea. I wanted everyone to know how I had these ideas that, unfortunately, couldn’t be realised because of the time constraints. That’s why when it came time to make the Wii game, that frustration must have become a great motivation for bringing all sorts of ideas to fruition. Did you learn a lot by working on the Wi-Fi gameplay for the DS? I suppose there were lots of cases similar, for example, to how in the Wi-Fi gameplay you begin a Wi-Fi match with four players, but then before you know it, there are only two players left. I was very shocked. You’re playing, and little by little the number of players decreases. The track gets deserted! That’s why this time, in the Wii version, we expanded the functions and put in measures to prevent situations like that. I’d like to hear more about that later on.